The 100 Column Pagoda is located at Sam Bor District in 36-kilometer distance, North of the provincial town by the National Road No 7. 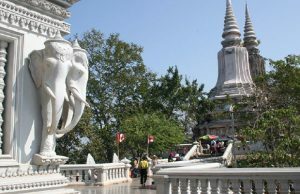 The special features of Sar Sar-100 pagoda are: The 100 Column Pagoda was built on the place where the Royal Palace temple of Sam Phu Borak Capital of the Chen La time located. 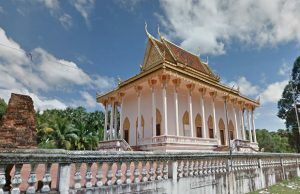 At the area, there are four-Buddist temples facing to different directions: 1- Vihear Lao faces to the West 2- Vihear Sar Sar-100 faces to the North 3- Vihear Kork Keut faces to the East 4- Vihear Kork faces to the South (this Buddhist temple has only base and mark remain). 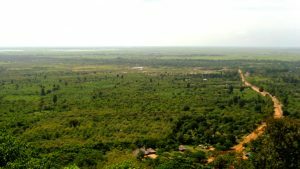 During the Khmer New Year, the local people who live near the former sam Phu Bo Rak Capital usually celebrate the four-day festival by starting at Vihear Sar Sar-100 first, then Vihear Kork and Vihear Lao lastly. Background of Vihear Sar Sar-100: Was built in 1806 and the size is 30 Meters x 30 Meters. 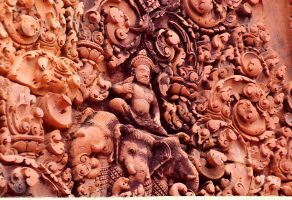 In the former time, at the 100th column, was thatched by Preah Ang Chan Reachea II for dedicating to the power of Vihear sar sar-100 to maintain the soul of Preah Neang Varakak, his daughter who was swallowed by the crocodile, Nen Thun. Vihear Sar Sar-100 is different to other temples because it faces to the North. About 100 years later, the temple was damaged by the strong lightening, which caused 22 columns burnt down and the statues dirtied by smoke. Because of this incident, the temple was pulled down and rebuilt by the local people, but it had only 78 columns. Until 1987, the 100-column pagoda has once again been renovated with 35-meter length, 18-meter width, 23-meter height and 116 columns; also, the temple has completely been renovated, inaugurated and Sey Ma buried on January 14, 1998.